If you eat a piece of fruit today, thank a honey bee. Chances are, the bee was directly responsible for its pollination. 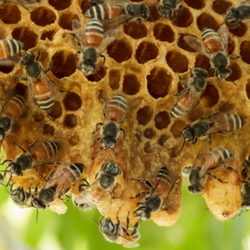 Honey bees not only produce honey, but are an important agricultural asset as well. For thousands of years, man has harvested honey from our insect friend, the honey bee. There are even ancient cave paintings depicting bees and honey gathering from all across Europe and Asia. Records in ancient Egypt and India indicate that beekeeping or apiculture has been practiced as a commercial activity for almost two thousand years and in Asia for possibly longer than that. There are several species of bees that produce honey, however Apis mellifera is the most common and for the purposes of this article, will be the primary species discussed. This bee is known as the European Honey Bee or Western Honey Bee. It is a cavity-nesting bee so that makes it easy to domesticate and train to live in man-made hives. There are other species of honey bees that prefer open nesting on tree branches or in shrubs and this habit makes it impossible to contain them in the commercial hives. 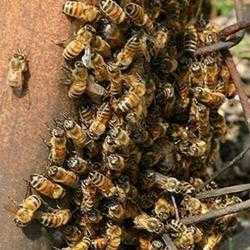 Beekeepers often receive calls from anxious neighbors who have discovered a colony in an old tree stump or even in an attic. They can be captured and introduced to a man-made hive and they usually accept the new home just fine. 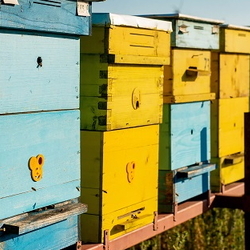 Beekeeping in Europe was a respected occupation and during World War II, the British government even allocated precious sugar to beekeepers to help sustain their hives. The European Honey Bee, Apis mellifera is the honey bee that North Americans are familiar with as well. It was introduced to the continent in the 17th Century by immigrants who brought with them a long history of beekeeping and honey production. The bees thrived and spread across the continent even quicker than their human hosts. Colonies of feral bees promptly set up housekeeping in hollow trees and fallen logs. Native Americans quickly learned to spot the hives and harvest the honey. As settlers spread across the continent, honeycombs were already waiting for them. The same thing was happening in New Zealand and Australia. Wherever Europeans went, so did their honey bees. Unlike most immigrant insects, it is an introduced species that has been welcomed by everyone. Honey has long been used by man. It is obviously a natural sweetener, however it also held significant religious and cultural importance by many societies. Buddhist, Hindu, Jewish, and Islamic peoples all consider honey of spiritual importance and it is used in many offerings and ceremonies even today. Honey was also used in medicine and many peoples used it when binding wounds. It actually does have antibacterial properties and helps resist infection. In many old writings, you'll find where wounds were smeared with honey before binding. Honey bees are also important pollinators. They visit the flowers for the nectar, but also collect pollen. As they move from blossom to blossom, they leave a bit behind, which pollinates the flower. Most of us are aware of CCD, Colony Collapse Disorder and its effect on our bees, but with the disappearance of the bees, many crops and plants are lacking pollination. There are other insects that pollinate, but the bees did a large part of it and their absence is quite noticeable. It is important as we garden to limit pesticides that kill bees. We can do our part by giving them a safe area to collect nectar and pollen in a poison-free environment. I have up-close access to local beekeepers. My dentist keeps bees and he lives just down the road. (one of the benefits of small-town living.) My good friend Lisa also started a couple of hives this year too, so we have a vibrant and active beekeeping community here in western Kentucky. I'm learning what it takes to keep a hive functioning and learning about honey bees up close and personal. There are a number of different residents in a hive and they all have specific jobs. There is the queen bee of course and she is treated like the royalty she is. The worker bees are non-reproducing females and they have a number of jobs, from collecting nectar and pollen to tending the queen and her eggs. They also produce the honey and build the honeycombs. Depending on what the pupae are fed while they are developing, the resulting adult can be a queen, worker or drone. The males, or drones serve one purpose. They mate with the queen and only a few of them are needed for that job. They also die after mating. So, the bees you see out and about are the sterile female workers. As gardeners, a fuller understanding of bees may help us provide a healthy habitat for them in the coming years and that can be an excellent start to helping them make a come-back. Honeybees love native or species plants for their pollen and nectar, so make sure you have a few wildings around for them. I've personally found that they adore plants in the mint family. My chocolate mint hums with activity as does my oregano bed. The lead image in this article is one that I shot of a honeybee enjoying my oregano. Give them a sunny area, with plenty of flowers and you should see them return to your area as well.